You are here: Home / Blog / handwriting / Visual Perceptual Printables for Thanksgiving – Freebie! 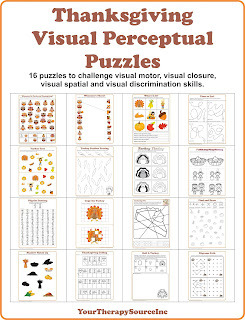 Visual Perceptual Printables for Thanksgiving – Freebie! visual discrimination, visual spatial, visual closure and overall visual perceptual skills with these printables. Print off multiple copies for your students and your activities are ready to go for fine motor centers in the classroom, visual motor skill practice, special education classrooms, early finishers and/or handwriting warm ups.